SAPUI5 uses web standards like HTML5 und CSS, this makes it easy to adapt the look and feel. The sum of all visual adjustments is called theme, which contains all CSS configurations for size, color and spacing of all UI elements. 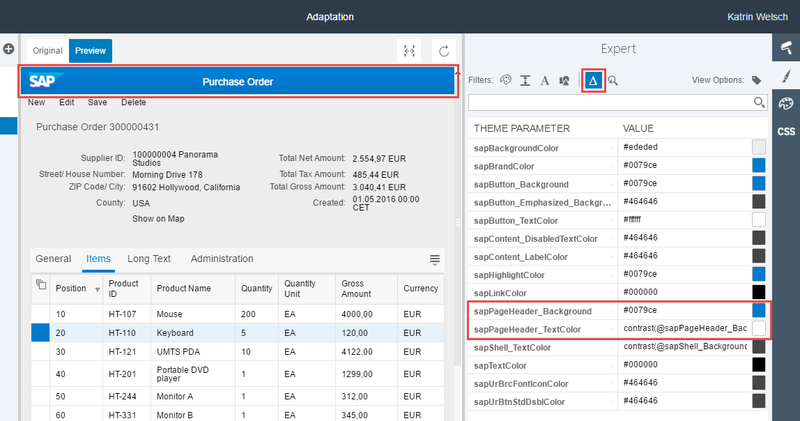 aBPM provides you the possibility to use the UI Theme Designer for creating your own custom themes which is available for free via the SAP HCP trial account (https://account.hanatrial.ondemand.com/). In the Subscribed HTML5 Applications section, choose New Subscription. In the New HTML5 Subscription dialog box, choose the existing themedesigner subscription. An application URL is displayed. In the Application column, select the new themedesigner entry. Under Active Version, click the URL or copy it into your browser. When building a Theme for aBPM we recommend to use the exact same version in the Theme Desinger as found in aBPM. Otherwise you may experience problems on UI elements that have been changed. Within the theme designer you can either upload a custom theme for adaptations or build a new one based on an already existing standard theme. 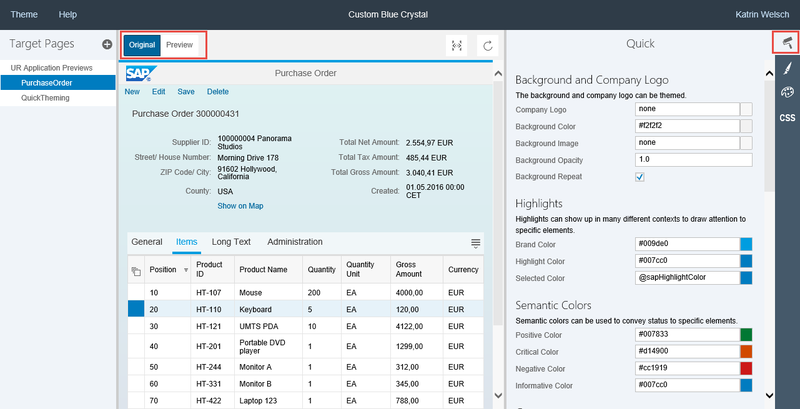 In this example we want to build a new theme based on the standard theme sap_bluecrystal. The Theme Designer can use an online web page to directly show the changes you do when manipulating the current Theme. The page is called target page. But since this page has to be in the same network as the Theme Designer we have to use the provided example applications and UIs to review our changes. Choose one Target Page to show your changes directly. Select e.g. “UR Application Previews” and “Purchase Order” as well as “Quick Theming”. This selected target pages appears in the tree on the left side. Now click on the “Purchase Order” item in the tree. The page appears. You can now start manipulating the Theme. Your changes will directly be displayed on the Preview tab. Compare it to the original target page when clicking the Original tab. The Theme Designer offers three modes for adapting the Theme. The quick, expert and freestyle CSS mode, which can be accessed via the bar on the most right of the screen and offer different degrees of flexibility. Within the quick mode you can set some basic properties (e.g. Brand and Highlight Color) which may influence multiple theming parameters. For more detailed settings switch to the expert mode. Here you can filter for different types of theming parameter (e.g. colors, dimensions,…). But you can choose the magnifier symbol to select an element on the preview page and see its respective theming parameter. E.g. we wanted to adapt the color of the page header. Therefore we selected the header part of the target page in the magnifier mode within the expert mode. The correct theming parameters can be identified by their names (or by try and error) as shown below. We changed the sapPageHeader_Background to blue (#0079ce). The text color is adapted accordingly to white based on the background color set, due to a LESS function which sets the text color based to a contrast threshold. As you can see in the picture above we also changed a view other parameters, e.g sapBackgroundColor to obtain a different UI background color. When clicking the triangle symbol all changes already made are listed. The Theme ID will be used later as a configuration parameter and a folder name. It is mandatory to use only small letters and numbers for the ID. You will receive a zip file. The newly created Theme is now ready for being used it in a Java Web Archive. How to use this zip file within your aBPM project will be the topic of part 2 of this blog series.